After 14 years with the Royal Ballet in London I moved permanently to Spain over 20 years ago. Life is good (in fact – extremely good!). Add almost permanent sunshine to the mix and it is even better. Now blogging about two of the loves in my life – Tapas and the amazing city of Málaga which I am proud to call my home. Life would not be as good without my wonderful Canadian Co-Director; Laura, (from the Toronto area) and her equally wonderful husband, Jorge Aparicio González who make work and Málaga so much fun!! 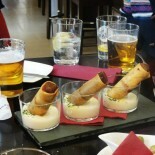 We love “eating our way around Málaga” with clients from all over the world on our Guided Gourmet Tapas Tours.